With the offseason now here for 28 NFL teams, the start of the new year will be here before you know it, and with it, the opening of free agency. March 9 is the big day, but a lot can happen between now and then—including franchise tags, re-signings, and cuts. Here is an early look at the best players about to hit the open market that will likely fly under the radar. 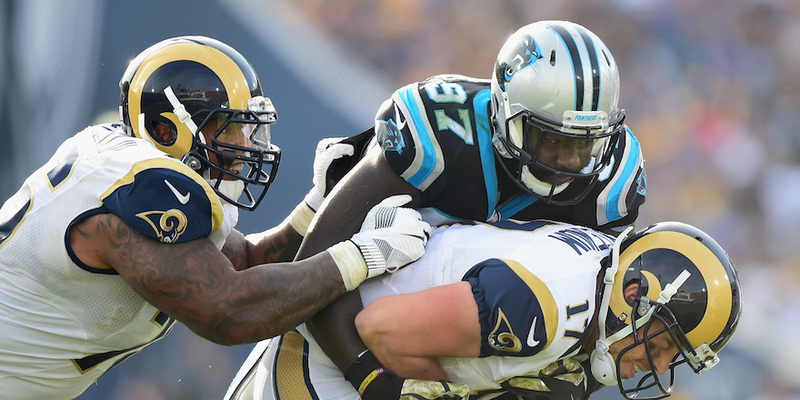 Right tackles continue to be overlooked in the NFL, and will therefore fly under the radar. Ricky Wagner fits this mold, as he’s been a solid RT for the Ravens over the past three seasons. Seemingly an outlier year in 2015, Wagner graded as a top right tackle in the NFL in 2014 and 2016. He started the year off shaky, surrendering three sacks and four hits through six games, but didn’t allow a single sack or hit on the QB in his final eight games (he missed two games). Wagner’s knock is his run blocking, as that facet of his game is below-average, but in a passing league, his pass-blocking ability should be coveted. Tretter is currently slated to hit free agency, but expect GM Ted Thompson to try to re-sign the fourth-year career backup. Tretter has been a valuable piece for a Packers’ team that has seen injuries hit the O-line in recent years. Tretter has played every position on the line for Green Bay, but when he stepped into C Corey Linsley’s shoes, there was no drop-off in play. With Green Bay starting RG T.J. Lang also set to hit free agency (at 30 years old), expect Thompson to let Lang to walk and sign Tretter. With a relatively weak draft class in terms of offensive line talent, however, Tretter may be wise to test the market and have a team overpay for him. Redskins interior defender Chris Baker will turn 29 in 2017, but he has been a very good all-around player on the defensive line for two seasons. Baker gets consistent pressure on the quarterback, but is an even better run defender, as you’ll rarely find the veteran out of position. While Baker’s production took a slight step back in 2016 from 2015, he still is a reliable and dependable option for teams looking for stability on the D-line. A former undrafted free agent, Addison has always been a decent pass-rusher, but took his game to the next level in 2016, cracking double-digit sacks for the first time his in career. Ranking second among 4-3 defensive ends in pass-rushing productivity, Addison totaled 10 sacks, five hits, and 51 QB pressures on just 294 pass rushes. In addition to becoming a more impactful pass-rusher, he had his best season in run defense, recording career highs in tackles and defensive stops. Addison will be 29 years old in 2017, so his prime window will be shorter than most, but he’ll prove to be a good sub-package pass-rusher for teams. A mostly dead position in the NFL, true fullbacks rarely see the field in today’s pro game. Kyle Juszczyk is bucking that trend, as he totaled 465 snaps in 2016, which would have ranked him 27th among all HBs. The former Harvard bruiser brings a dynamic element to the position, as he is the best all-around blocking back, and pairs that with good usage as a receiver and runner. Juszczyk won’t be coveted by many teams because of his position, but his ability as a receiver can extend drives and change games. Gerald Hodges was traded to San Francisco in 2015 by the Minnesota Vikings for C Nick Easton and a 2016 sixth-round pick that was used on WR Moritz Boehringer. While neither player really panned out well for the Vikings (Boehringer was released by Minnesota in September, then signed to the practice squad, and Easton earned a 45.9 grade in 414 snaps this season), Hodges, after initially struggling to adapt to his new team, has played very well for the 49ers. A good run defender and an effective pass-rusher, Hodges’ 9.3 run-stop percentage ranked 13th among linebackers, while his 16.4 pass-rushing productivity mark was 10th-best. His improved coverage in 2016 is what boosted his overall grade, as he allowed a passer rating of 87.3 after surrendering a 125.5 mark in 2015, and 114.3 in 2014. Hodges’ versatility should make him a solid option for any team in free agency. Harmon is an intriguing play for free agency, as he’s always been a backup in New England—with a few spot starts when needed—and has played very well. Harmon plays almost all of his snaps at deep FS, and is rarely targeted (30 targets in his career), but makes the most of those targets, coming away with nine interceptions and three pass breakups (not all INTs were when he was primary coverage player). Harmon has allowed 20 catches for 254 yards, but just eight catches for 122 yards the past two seasons combined. The biggest question for Harmon whether he is just a part-time role player, or if can he blossom into a bonafide starter and build on his impressive numbers. The Vikings had a tumultuous season with an offense in disarray—largely due to the revolving door on the offensive line—but Adam Thielen was a steady and consistent player, finishing as the No. 19 WR in terms of overall grade. When Bradford targeted Thielen, the QB yielded a passer rating of 121.9 that ranked third among WRs with a minimum of 62 targets. A versatile weapon, Thielen caught 80 percent of his catchable targets from the slot, seeing 20.5 percent of his targets there. There is still some projection to Thielen’s game, but his production this season warrants consideration and provides upside for many teams. Burkhead is an intriguing free agent this offseason, as he shows good ability to make defenders miss, with an elusive rating of 49.9 (albeit from a limited sample size). Burkhead has good vision and burst, with very little wear and tear with just 89 career carries. This past season, Burkhead finally got his chance following the injury to Giovani Bernard, and graded very well. On 74 carries, Burkhead averaged a solid 4.6 yards per carry, with 3.0 coming after contact. In the final game of the season, the Bengals fed the former Nebraska Cornhusker 27 times; he turned those opportunities into 119 yards, two touchdowns, and two missed tackles forced against one of the best run defenses in the NFL (Baltimore). While Burkhead probably isn’t an every-down back, he should be valuable to teams looking to add a change-of-pace back. An undrafted free agent from the University of Kansas, McDougald has worked his way into a starting role with the Buccaneers. Not particularly great in any one area, McDougald is a solid all-around safety that isn’t a liability on the back end. The former Kansas Jayhawk has allowed just three touchdowns in his career, and has seen his allowed-catch percentage drop each season, despite seeing the most targets in his career in 2016. With five career interceptions and 13 pass breakups, McDougald is the type of free agent that will command a very affordable contract for above-average play.